Kudos X2 review | What Hi-Fi? 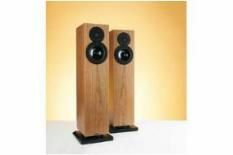 Our July 2010 issue featured an enthusiastic review of Kudos’s £5500 Cardea C30 loudspeakers. This X2 floorstander is the British manufacturer’s first attempt at bringing a bit of that high-end sparkle to the masses. That’s assuming the masses can spare £1350 for a pair of speakers, of course, and the masses don’t want something too intrusive. At 78cm tall the X2s are usefully compact, wood-veneered and nicely finished. There’s a reflex port at the bottom (the plinth provides a fixed boundary gap) and a single pair of binding posts at the back. Up front, a 25mm fabric dome tweeter sits above a 150mm paper cone mid/bass driver. They’re not picky about room position, although they’re most comfortable standing away from side or rear walls. Apply a touch of toe-in and you’re good to go. Joan As Police Woman’s Nervous shows the X2s off to good effect. Considering the modest volume of the cabinets, the Kudoses summon decent low-frequency presence and punch, to the point that you’ll need to choose partnering electronics with care. There’s very agreeable fluidity to the X2s’ presentation, and this cheerful musicality is allied to an assertive, driving and impressively dynamic character that keeps even the most pedestrian tempos on the front foot. This spaciousness and speed is complemented by excellent attention to detail. There’s a certain lack of unity between treble sounds and the rest of the frequency range, though, a suggestion of greyness and grittiness to the top end that’s at odds with the smooth fluency of the sound otherwise. This graininess is just enough to cost the X2s that final star.